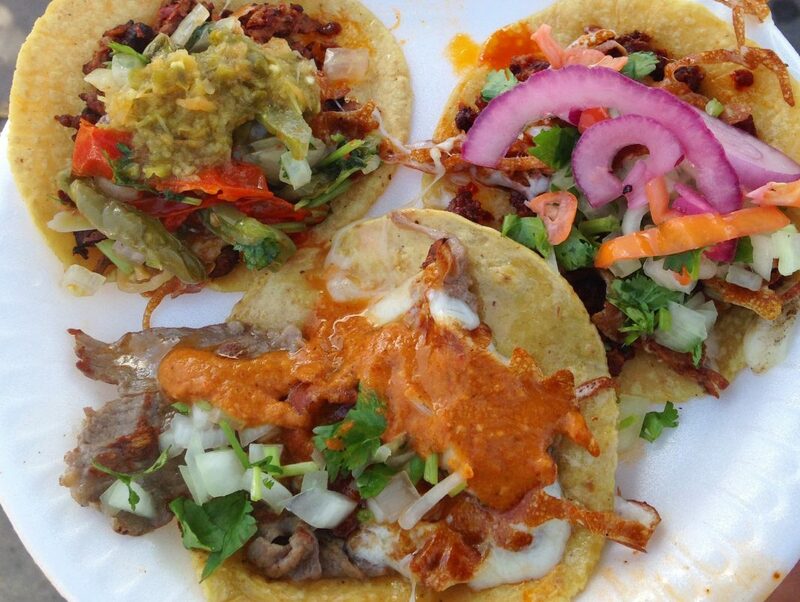 Vegetarian tacos and more from a Chalmita-style street food find in East L.A. The very best Mexican foods start with the letter T—tacos, tortas, tlayudas. Here we showcase the tastiest “T” bites from the streets of L.A. The local barbacoa (pit-roasted meat cooked with the spines of a century plant, usually lamb, goat, or beef but can be any protein) scene is really something else, with a variety of styles that could only exist in the second largest Mexican city in the world: Los Angeles. We have lamb barbacoa from five Mexican states, goat barbacoa from Oaxaca, and even chicken and beef barbacoa. So it wasn’t exactly a surprise when I had my first taste of Chalmita (a city in the State of Mexico) style lamb barbacoa and pancita (offal-stuffed lamb stomach) tacos at Tacos Quetzalcoatl, a decked-out street food cart named after the Aztec feather serpent god that parks in East L.A. on weekends and in Downtown during weekdays. Owner and street food veteran Max Enriquez does more than just make tasty barbacoa though. Tacos Quetzalcoatl offers tacos quelites, which are made with a family of wild greens that have been used since pre-Hispanic times and are still used in traditional and modern Mexican cuisine. In fact, pretty everything on this truck is outstanding: condiments and salsas are expertly crafted, tortillas are made to order, and besides tacos there are huaraches and quesadillas too. Enriquez’s taco truck is an exciting option for vegetarians as well. Try the tacos de huauzontles (Aztec spinach), which are filled with a mix of stewed huauzontles, quintoniles (red amaranth), spinach, alfalfa, and a blend of three cheeses. The second vegetarian option is the Omega 2 consisting of a fresh-made tortilla filled with sautéed squash, mushrooms, spinach and melted cheese—you’ll find all of Enriquez’s tacos to be out of the ordinary, like homemade longaniza, or cecina topped with a blanketed fried cheese, chicharron de queso. This is a rare taste of State of Mexico cuisine that stretches beyond barbacoa—though the barbacoa is excellent too—prepared with a traditional flair and flavor that makes Enriquez’s truck one of the best street food finds in years. What Makes Some of L.A.’s Best Al Pastor Tacos So Good?